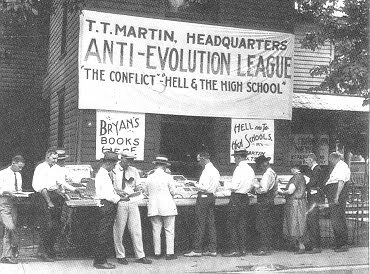 .... 1925 (85 years ago), a Dayton, Tennessee, John Scopes, a public high school teacher, was arrested for teaching evolution in violation of a new state law. Scopes had agreed to act as defendant in a test case just 1 day after the American Civil Liberties Union ran an ad seeking same in the Chattanooga Times. Scopes and other Daytonians "hoped that a trial of this type would bring much needed publicity to the tiny town..." A "media circus" of a trial ensued. (credit for photo made during the trial; more available here) Scopes was convicted, but the state's highest court later released him on a technicality. The Tennessee law barring instruction in the theory advanced by Charles Darwin would not be repealed until 1967.